MANILA, Philippines – The October 2017 CPA board exam results are released online on November 2, 2017 or in 10 working days after the exams. The alphabetical list of passers, N-Z surname, is available on this page together with other results - top 10 (topnotchers), top performing schools and performance of schools. The Professional Regulation Commission (PRC) and the Board of Accountancy administered the CPA board exam to more than 15,000 examinees in the cities of Manila, Baguio, Cagayan de Oro, Cebu, Davao, Iloilo, Legaspi, Lucena, Tacloban and Tuguegarao on October 7, 8, 14 and 15, 2017. The members of the Board of Accountancy are Joel L. Tan-Torres, Chairman; Eliseo A. Aurellado, Gerard B. Sanvictores, Gloria T. Baysa, Concordio S. Quisaot, Samuel B. Padilla and Arlyn S. Villanueva, Members. As one of the hardest licensure exam in the country today, the licensure exam tests aspiring accountants on these subjects: taxation, financial accounting and reporting, practical accounting I, auditing, auditing theory, theory of accounts, advanced financial accounting and reporting, practical accounting II, regulatory framework for business transactions and auditing problems. According to PRC Resolution No. 2016-1019, the target release of results of the recent CPA board exam is on Wednesday, October 25 or in 6 working days after the test (8 days on original target). Note that government work was cancelled on Monday and Tuesday (October 16 and 17) due to nationwide transport strike. 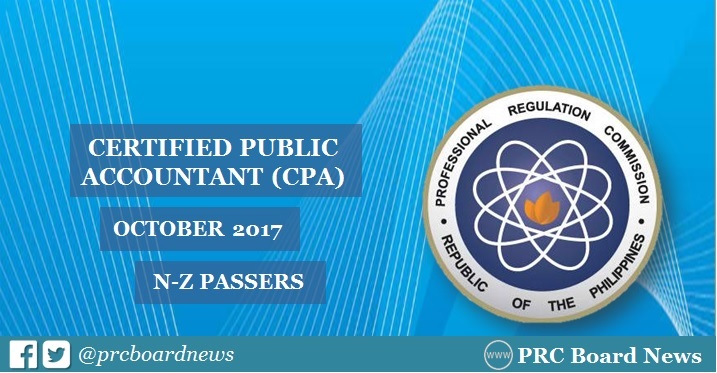 The Professional Regulatory Board of Accountancy on Facebook has advised: "Due to the cancellation of government office work this week which resulted in the delay of the processing of PRC work, the new release date of the results of the October 2017 CPA Examinations will be on November 2 or 3, 2017, instead of the previously announced date of October 20/21, 2017." Amazing blog post,Here it is the astounding video which enlightens us concerning the casting a ballot control and get info to click on https://www.futuremdresidents.com/services/ if you wanna to get quality work. We individuals did not comprehend the intensity of the vote. What's more, squander our vote. Thanks for sharing such type post,This soup is extremely solid for the human. In the wake of seeing this soup my heart need to drink and appreciate it. Furthermore, interestingly, you notice all the fixing which is important for making this soup and students easily get here to improve their work. I will attempt this soup and I prescribe to my companion to visit this site for this soup. Amazing blog post,I have no uncertainty about the aptitudes of the Pete Carroll. USC football loses the great mentor and he can work with the young men with an inviting domain Now look at this website to manage your thesis work. Also, under the supervision of the Pete young men offering considerations to the amusement yet it is exceptionally dismal news for me.